In 2012, the share of electricity generated from renewable sources in gross electricity consumption was 29.5%, which was 4.1 percentage points below the target value set for 2010. 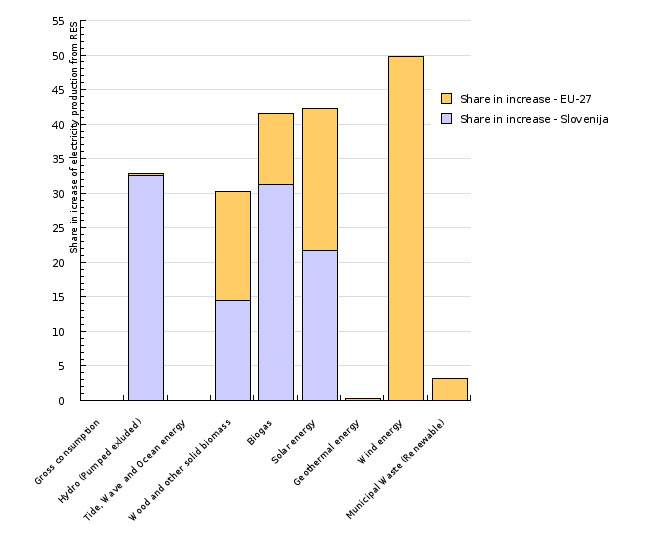 The share increased in comparison to the previous year. This is largely a consequence of higher generation of electricity from renewable sources, particularly due to higher river discharges, as gross electricity consumption was almost the same as a year earlier. In 2012, electricity generation from hydropower represented 90% of total electricity generated from RES, while its share has been in gradual decline. Taking into consideration normalisation of hydroelectric power plants, their share in total electricity generated was 31.6% in 2012, which is 7.7 percentage points below the indicative objective for 2020. This indicator shows the production of electricity from wind, solar, geothermal and hydroelectric energy as well as from biomass. Electricity production from biomass includes production from wood and wood waste, renewable waste (digestate, straw, etc. ), municipal solid waste, biogas (landfill gas, gas from wastewater treatment plants, other biogases) and liquid biofuels. Using renewable energy sources is the most environmentally friendly way of electricity production as it causes the minimum amount of greenhouse gas emissions and air pollutants. Of course there are differences between the sources with regard to their environmental impacts. The use of wood biomass causes similar NOx emissions as natural gas; if used in older boilers, it causes high emissions of volatile organic compounds and particulate matter. Furthermore, overconsumption of wood biomass may affect biodiversity or industrial sectors that use wood as raw material. Larger hydroelectric power plants have a huge impact on the landscape and represent a disturbance for ecosystems and hydrology. The production of some photovoltaic modules requires the use of heavy metals, etc. Detailed planning of the use of renewable energy sources can reduce these negative impacts to a minimum. In order for electricity production to become more environmentally friendly, the use of RES in electricity production must increase at a faster rate than the growth of total electricity production. Therefore, it is particularly important to monitor the share of electricity generated from RES within the indicator, as this provides information on whether electricity production is becoming environmentally friendly or not. Renewable energy sources in Slovenia significantly contribute to electricity production and the coverage of the country’s electricity needs. In 2011, their share in gross electricity consumption amounted to 26.2%. Compared to the preceding year, this share increased by 7 percentage points, while compared to 2000, it decreased by 6 percentage points. In 2010, it was more than 7 percentage points below the 2010 target share. This share is influenced by electricity generation from renewable sources and gross electricity consumption. In 2011, electricity production from RES amounted to 3,877 GWh. Compared to the preceding year, at 18%, it had decreased considerably. Most renewable electricity in Slovenia is produced by hydroelectric power plants. 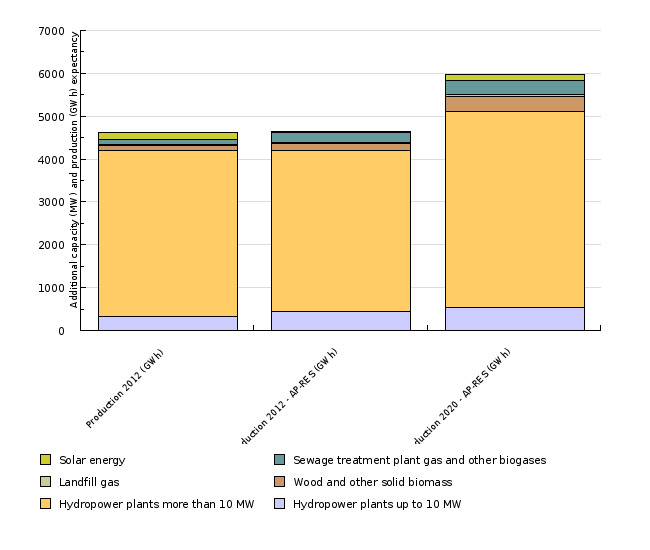 In 2011, their share in renewable electricity was 91.8%, followed by biogas (3.3%), while the contribution of wood and other solid biomass was 3.2% and the share of solar power was 1.7%. Electricity generation in hydroelectric power plants is subject to high fluctuation from year to year as it depends on hydrological conditions. While the net power of hydroelectric power plants increased by 25% in the period 2000–2011, the number of operating hours at full capacity fluctuated between the lowest value of 3,040 hours in 2003 and the highest value of 4,058 hours in 2000. In 2010 the number of operating hours at full capacity amounted to 4,201 hours, while in 2011 it dropped to 3,317 hours. 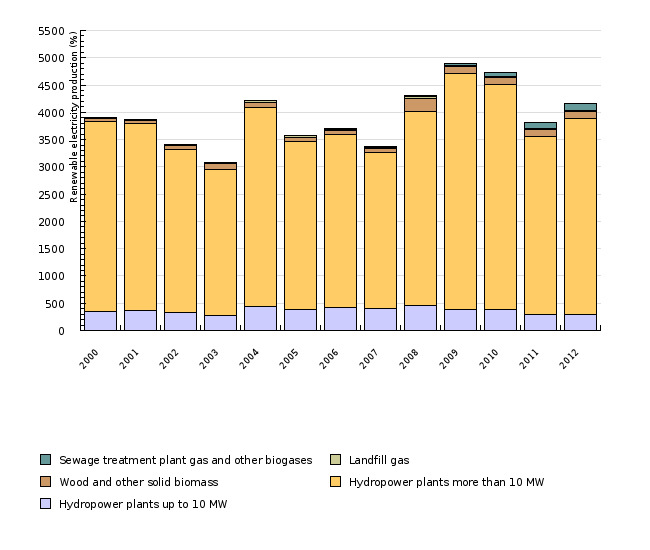 Electricity production from biogas (including landfill gas, gas from wastewater treatment plants and other gases) increased by 972% in the period 2000–2011. In particular, this growth is a consequence of rapid development of electricity production from other gases, where agriculture prevails, which can be contributed to the effective system of guaranteed purchase prices. In electricity production from wood biomass, the introduction of cogeneration in the Ljubljana combined heat and power plant in 2008 was a significant step forward. In 2008, wood was also used as an additional fuel in the Šoštanj and Trbovlje thermal power plants. Before that year, biomass was only used for electricity generation in heat and power cogeneration units in industry. In 2007, electricity production from solar power was introduced in Slovenia. In 2011, solar power production increased by 411%. Development in this field can also be attributed to the system of guaranteed purchase prices. In 2000, the share of hydropower in renewable electricity production was 98.2%, the share of wood was 1.5% and the rest was biogas. In 2011, gross electricity consumption was 3.2% higher than a year earlier, reaching almost the same level as in 2008. 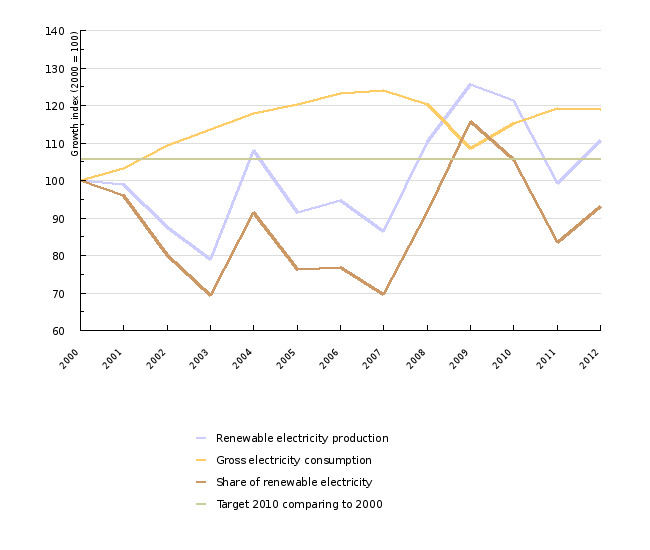 The highest value in the period 2000–2011 was achieved in 2007 at 15,721 GWh (see indicator EN12 Electricity consumption). By 2020 electricity production from RES is expected to increase to 6,024 GWh according to the reference scenario of the National energy programme and to 6,344 according to the intensive scenario. In the reference scenario, by far the highest growth is anticipated in electricity production from hydroelectric power, followed by biogas, wind, solar and wood. In the intensive scenario, a higher growth in solar energy, followed by growth in hydroelectric power and minimal growth in wind power is anticipated compared to the reference scenario. The most important of the measures for the promotion of electricity production from RES is the system of guaranteed purchase prices, which was renewed in 2009. It is regulated by the Regulation on supports for electricity generated from renewable energy sources and the Energy Act. The system operates in the same way as with heat and power cogeneration. Investments in new facilities are also promoted by the Eco Fund through favourable loans. In 2010, electricity production from renewable energy sources represented 19.9% in the EU-27, which was 1.7% more than in the preceding year. Compared to 2000, the share was 6.3% higher. The EU-25 set its target share for 2010 at 21.0%. In 2010, the share of electricity produced from REC in the EU-25 was 19.7%, which was 1.3% below the target. It was similar in the EU-15, where the share was 20.9% in 2010, while the target share was set at 22.1%. Among the Member States, the 2010 target was met by Belgium, the Czech Republic, Denmark, Estonia, Germany, Lithuania, Luxembourg, Hungary, the Netherlands, Portugal and Spain. 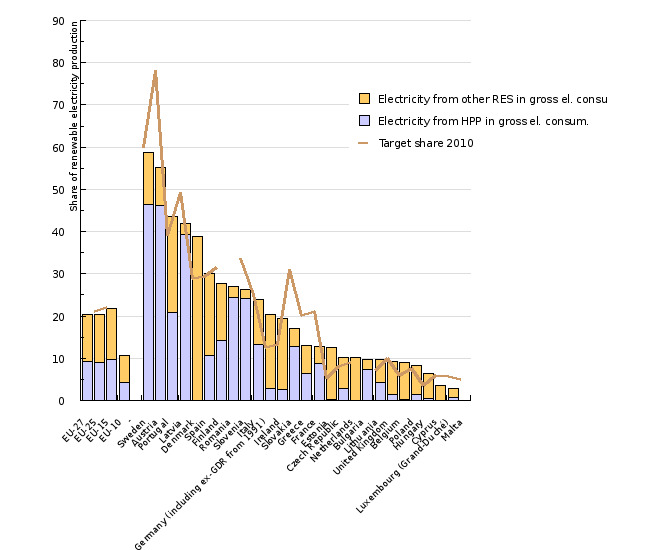 Interestingly, none of the countries in which the share of hydroelectric power represents more than 3/4 in renewable electricity production met their 2010 target. In the EU-27, the greatest increase in the period 2005–2010 occurred in electricity generation from wind energy, followed by hydroelectric energy, wood, other biofuels and solar energy. In Slovenia in this period, the greatest increase occurred in electricity generation by hydroelectric power plants, which contributed 90% to the increase in electricity generation from RES.